Using the Key Bet Roulette layout, Roulette Super Gambler differs in no other way than removing the Key Bet bonus feature. Therefore those that are familiar with the bonus roulette game will instantly recognise the betting options and animation style of Roulette Super Gambler. 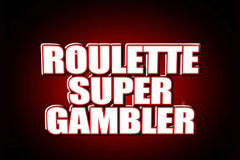 Roulette Super Gambler was created by SG Gaming and can be found on Coral and Ladbrokes Fixed Odds Betting Terminals. The minimum chip value is 25p, with the maximum win per spin at £500, and the minimum and maximum bets at £5 and £100 respectively. The nature of the game encourages large betting, with the chips multiplying in value far quicker than its roulette counterparts in William Hill, such as 20p Roulette. It is for this reason that the outcome of a gambling session on this game can result in larger wins or larger losses than many other roulette games. Due to the way the game has been animated, frequent players will most likely recognise winning or losing bets prior to the ball landing, which can be discouraging for regular players. The gamble on this game is accessed via any winning spin, and offers the most amount of gambling options of any roulette or slot machine so far released. With the ability to change the odds, and change the positions of the winning or losing areas, the player has a very good control over this part of the game. Any win can be gambled up to a maximum of £500, and as the betting terminal roulette game is random, a large succession of £500 wins is possible should your nerves allow it. Aside from the bonus gamble, Super Gambler Roulette is much the same as the traditional roulette games found on other betting terminals, with a different series of animations for the player to learn should they so wish. Roulette Super Gambler can be found in Ladbrokes and Coral bookmakers under the betting terminals 'roulette' tab.